On this edition of No Holds Barred, host Eddie Goldman spoke with unbeaten heavyweight boxers Charles Martin and Anthony Joshua, who face each other this Saturday, April 9. Martin (23-0-1, 21 KOs), who is 29 years old, will make the first defense of his IBF title when he faces Joshua (15-0, 15 KOs), 26, at the O2 Arena in London, England. Although he holds the belt, Martin, from Carson, California, in the U.S., is the underdog against Joshua, a 2012 Olympic gold medalist who is from Watford, Hertfordshire, U.K. This fight will be shown live in the U.K. on Sky Sports Box Office and live in the U.S. on Showtime. We spoke with both Charles Martin and Anthony Joshua on a media conference call Monday. On that call, Joshua predicted that he would win by a knockout by the sixth round, while a confident Martin dismissed Joshua as being "green" and inexperienced. 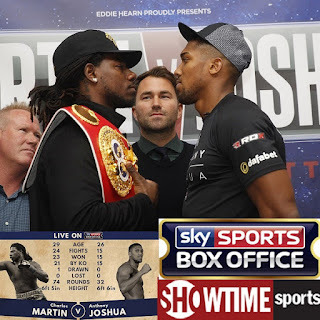 In a year when heavyweight boxing has yielded a series of unpredictable results and developments, we shall see Saturday if the local hero and favorite Joshua wins and fulfills the predictions of many that he is the future of the heavyweight division, or if the underdog and unexpected champion Martin retains his belt and proves the pundits and oddsmakers wrong. The Frank Gotch World Catch Wrestling Tournament. On Sunday, July 3, 2016, catch wrestlers from all around the world will compete in Humboldt, Iowa, the hometown of the legendary world champion wrestler Frank Gotch. Organized by the Catch Wrestling Alliance and co-sponsored by IAWrestle, the Frank Gotch Statue Committee, and the Frank Gotch Kids Wrestling Club, the event will take place at Humboldt High School. For more information, go to CatchWrestlingAlliance.com.